The Sin Bin Sports Blog: Could Schultz Be The Red Wings' Next Lidstrom? Could Schultz Be The Red Wings' Next Lidstrom? The Detroit Red Wings, like most other teams in the NHL, are in hot pursuit of sought after free agent, Justin Schultz. For an organization that just saw future Hall-of-Famer, Nicklas Lidstrom, retire, they are more than willing to bring in this future star with open arms. "We've contacted his agents to express the Detroit Red Wings are interested in signing him to a contract," general manager Ken Holland told MLive.com. "We think there's a tremendous opportunity in Detroit." Schultz is a star in the making. 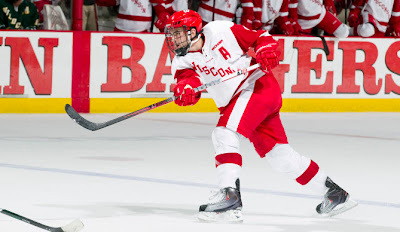 He has played his college hockey at Wisconsin where he had 16 goals and 44 points last season, and 40 goals and 113 points in 121 games over the last three seasons for the Badgers. Schultz was originally a prospect for the Anaheim Ducks, drafted 43rd overall by the Ducks in '08. Schultz de-registered from school, which opened a 30 day window for the Ducks to sign him. That window has opened and slammed shut on Anaheim, and all 30 NHL teams are now allowed to talk contract negotiations with Schultz. Schultz is considered the third most sought after free agent in this year's free agency class, behind already NHLers Zach Parise and Ryan Sutter. Schultz is said to be NHL ready and will likely be paired in the top two defensive pairings on which ever team is fortunate enough to sign the young talent. Schultz is said to be meeting with his agents in Toronto on Tuesday to go over his possibilites. Something that may play a major factor in Schultz's decision making, former teammate of Schultz, Brendan Smith, will likely be a nightly name on the Red Wings' roster next season. Schultz can not sign until July 1st, the official day the free agency opens. ***Update*** Schultz has reportedly narrowed his list of potential teams to five, and will be meeting with them over the next two days in Toronto. The Detroit Red Wings are not on that list.